An expert witness has told a fatal accident inquiry into the Clutha helicopter crash the lack of evidence from the flight was "frustrating". The inquiry heard the police aircraft, which crashed into the Glasgow bar in 2013, did not have a flight recorder. 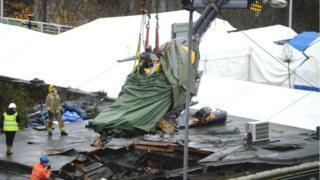 Peter Wivell from the Air Accident Investigations Branch said this was "frustrating for everyone". It meant there was no data about when fuel warnings came on and how long they stayed on for. Mr Wivell said it might also have shed light on the circumstances in which the pilot made his switch selections. Donald Findlay QC, representing the family of victim Robert Jenkins, asked the witness about flight recording equipment. Mr Wivell told the court: "The helicopter was not required and was not fitted with any type of flight recorder." Seven safety recommendations were made in an AAIB report following the crash, which happened at 22:22 on 29 November 2013. These included the introduction of a flight recorder system that would capture information about the flight's "pitch and roll", audio from the flight deck and images from the flight deck. Mr Wivell told the FAI: "The problem with this investigation was a lack of evidence." Pilot David Traill, 51; PC Tony Collins, 43; and PC Kirsty Nelis, 36, lost their lives in the crash along with seven customers who were in the bar on Stockwell Street. They were Gary Arthur, 48; Joe Cusker, 59; Colin Gibson, 33; Robert Jenkins, 61; John McGarrigle, 58; Samuel McGhee, 56; and Mark O'Prey, 44. Roddy Dunlop QC, representing manufacturer Airbus, asked for a video simulation of the helicopter's final flight to be shown in court. The footage was based on data from the helicopter's on-board computer system, radar information, details from Air Traffic Control and evidence about the fuel quantity and featured a timeline of the helicopter's final flight. 20:44 Helicopter took off from Glasgow City Heliport. Its first mission, in Oaklands, took 33 minutes. 21:22 Sets off for a routine task in Dalkeith, which lasted about three minutes. The video simulation stated the fuel transfer pumps were switched off at some point after the helicopter left Dalkeith. The narrator said: "There is no explanation as to why the pumps both came to be in the switched off position." 21:56 Pilot David Traill was in contact with Edinburgh Air Traffic Control. The video also noted that seven minutes after the fuel transfer pumps were switched off the fuel levels started to deplete. 21:59 Mr Traill was in contact with Glasgow Air Traffic Control. The first fuel warning is estimated to have come some time before the helicopter reached Bothwell. The video also confirmed five fuel warnings were received in total and acknowledged by the pilot. Towards the end of the flight both fuel warnings were "continuously illuminated"
22:19 Pilot was in contact with Glasgow Air Traffic Control but he expressed no concern. 22:21 Travelling at a speed of 100 knots and 2.7 nautical miles east of Glasgow City Heliport, the right engine flamed out. The video said the left engine flamed out 32 seconds later. At that point the police helicopter was 1.8 nautical miles east of Glasgow City Heliport. Post accident analysis revealed the main and tail rotas were not turning at the moment of impact. The video concluded that when the tanks were drained after the accident both supply tanks were empty but there were 76kg of fuel in the main tank. Earlier, Mr Wivell, 48, a senior AAIB inspector, confirmed findings of a previously published report which noted: "The transfer of fuel from the main tank to the supply tank stopped while the helicopter was returning to Glasgow from Dalkeith, leaving only the fuel in the supply tank available to the engines."